A local initiative to help police assist small children has garnered support from Webster University’s Luke Air Force Base location — and deepened an alumni connection with one of Glendale's first responders. 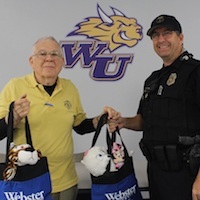 Longtime faculty member Herb Kretz led Webster's drive to contribute to the "Trauma Teddy" program, where the Glendale Police Department collects stuffed animals to help comfort small children during incidents where first responders are called. 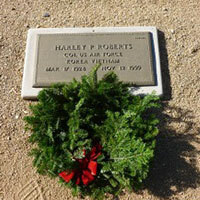 Students in the HRMG 5000 Managing Human Resources class at Luke Air Force Base, Arizona, took part in the 2017 Wreath Across America ceremony at the National Memorial Cemetery of Arizona, placing holiday wreaths on each of the resting places of the U.S. veterans interred there. 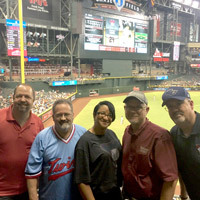 Webster directors in the Western Region had their first annual conference last week, hosted by David Handrahan of the Luke Air Force Base location. The entire conference was filled with training as well as opportunities to brainstorm about new and innovative ways to reinvent extended campus operations, with participation via WebEx from key departments in St. Louis.